Successful dachshund training will enable you, your family, friends and your dog to have a happy fulfilling relationship, you need to ensure that you and your dog, are well trained and individual roles are understood and respected. You may be happy doing all the education yourself or you may decide to have the additional assistance of a professional trainer, there are usually suitable courses available in you area. Dachshund’s are independent, clever, curious and a little stubborn but with consistent work using rewards they learn quite quickly and easily. When carrying out your dogs education you need to establish early who is the leader and it needs to be you, firstly by being calm firm and in control, so start as you mean to go on. Start setting the rules on the first day so there is no misunderstanding. By starting puppy training early we mean as soon as your puppy arrives home, handling, cuddling talking to your puppy is the beginning. Socialize your puppy with a variety of people and other animals is so important in the first weeks. Noises and a variety of situations, the more the better. Establishing a successful toilet training program for your dachshund is a much about your commitment which adds to your dog’s success rate. Establishing good routines, making sure access to toilet area is easy for your puppy. Plenty of praise and rewards are all part of the deal. Some owners find using a crate for your puppy makes toilet training easier but this decision is up to you. Some dachshund owners find using a crate as a safe secure place for their puppy, when you are not able to offer your puppy the supervision required. Also it can be useful when carrying out your toilet training program. The crate gives the puppy a warm, comfortable home that is his alone. Basic obedience training is an important part of you and your dog’s partnership. The trust that develops between owner and dog when you work as a team, you give the commands and your dog shows he can please you with the correct responses. Having control of your dog is not only a safety issue it makes life for you both more enjoyable. Lead Training needs to start early, ensure you have a comfortable well-fitting collar or harness. Start this training in a familiar area, perhaps even start inside the house, then move into the back garden. When you think you are ready for the street, try to choose a quiet area without too many distractions for your puppy. These events can be alot of fun, mixed in with alot of training. If you are a person who enjoys a challenge and competition then this could be for you. 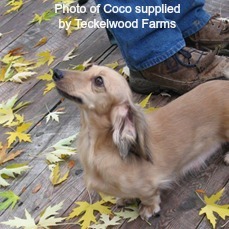 The dachshund breed excels at certain events such as the Earth Dog Trials and the Dog Field Trials, as they were breed for these. If you don’t think these events are for you, then why not try your hand at dog obedience trials or dog shows, it’s really up to you.